In this modern era, we no longer have the time write out whole sentences. BC FML WRKING 2 L8 2 WRITE. Heck, we don't even have the time to watch an entire 5 minute video. We need 10 second long Vine videos. We need super high speed internet and Vortex beer bottles because, apparently, beer was not getting to our mouths quick enough. Therefore, in respect to modern time constraints, I suggest that we finally just get rid of three syllable names, altogether. This has slowly been happening, over the years, already. 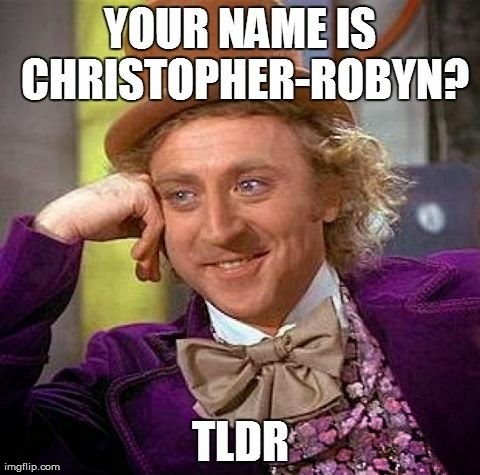 Example: Christopher = Chris. I don't think I have EVER uttered the name Christopher, outside of a Winnie the Pooh book, in my life. Just name your kid Chris, for God's sake. Jonathan, don't even get me started. John, your name is John. It was always John and it will always be John. You are only Jonathan on your driver's license, birth certificate and death certificate. And, when you do kick the bucket, people will say, "Who was Jonathan? I thought we were here for John's funeral?" Kimberley, what are you a Knock-off Barbie doll? Your name is Kim. Bethany, your name is Beth. People only use their full names when in some sort of trouble or when they are applying for a business permit. No self-respecting bank would trust a Chris. I'm pretty sure the pot dealer behind my house is named Chris. But, Christopher is a different story! That guy's got class; he hangs out with Winnie the Pooh and goes on all sorts of adventures! Let's give him a business loan. Chris's D.B.A is Christopher but only he and the bank know that. Want To Boost Your ClickBank Banner Commissions And Traffic? Bannerizer made it easy for you to promote ClickBank products by banners, simply visit Bannerizer, and get the banner codes for your chosen ClickBank products or use the Universal ClickBank Banner Rotator Tool to promote all of the ClickBank products.